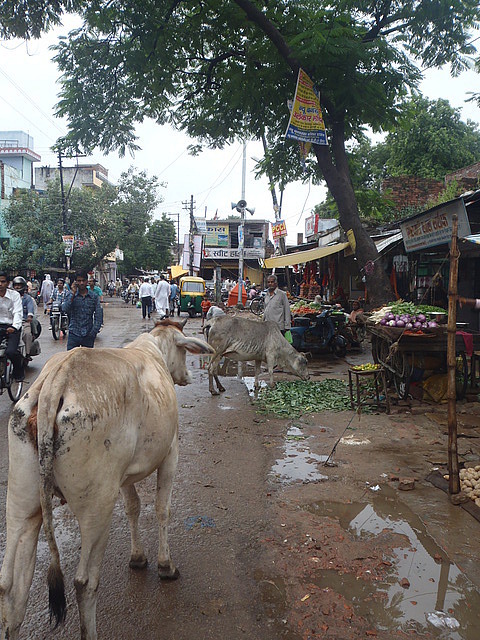 SHIVPURI, MADHYA PRADESH, INDIA — The night before leaving Delhi, I found myself stuck in yet another staggering traffic jam on one of the east-west arteries crossing the south side of town. As I gingerly split the lanes in 1st gear, the driver of a car I squeezed past rolled down his window. 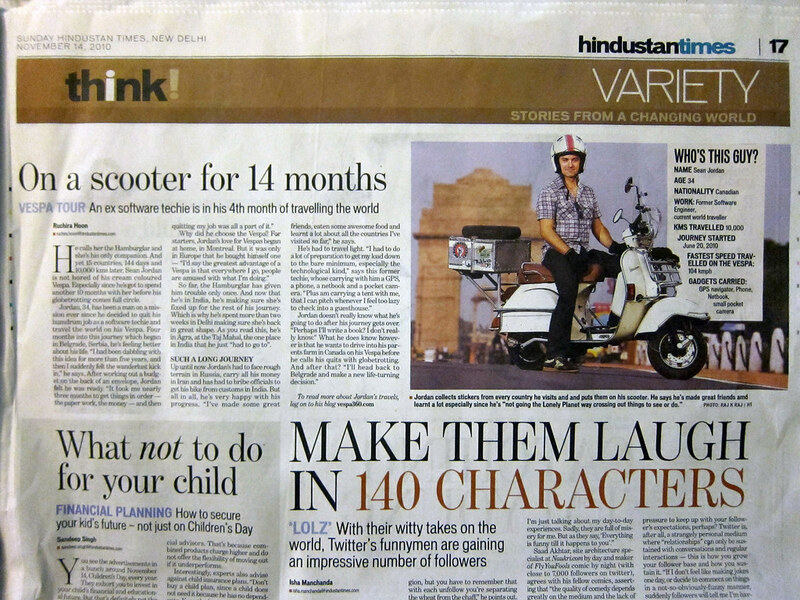 “Are you the man from the Hindustan Times?” he asked. “You’re crazy!” he said, and gave me the thumbs-up, with a head bobble thrown in for good measure. I continued on my merry way at 3km/h, sitting a little more upright on my increasingly sagging saddle. I spent the rest of the ride admiring myself in my mirrors, pondering whether or not I should put on my sunglasses so as to look even cooler. My fifteen minutes weren’t up just then, either. Later on in the evening, while waiting by the side of a highway for a friend to show up, another stranger — this time on a motorbike — recognized me, pulled over, and asked if I was that guy from the paper. He had to get a picture, and so did I.
I didn’t have enough time to let my head swell too much, though, because I was off to Agra the next morning, and it’s hard to conceive of anything more devastating to the ego than a long two-wheeled ride on a North Indian highway. I very, very quickly learned that there’s a clear pecking order on those roads, with trucks and buses at the very top, and motorcycles and scooters way, way down at the bottom, below even pedestrians and cattle. Buses and trucks and minivans and cars swerve and lurch all over the roads as though you don’t even exist. It’s shocking at first, this wilful blindness of Indian drivers to the existence of the people on bikes — actual human beings whose lives, in theory, have some value — sharing the road with them. The carelessness with which they drive seems to be in inverse proportion to the mass of other objects in their way, which could lead a person to think their primary concern is the paint and bodywork of their own vehicles, and not much else besides. One subject that came up, the persistent popularity of arranged marriages in India, threw me for a loop. We’ve all heard about this Indian custom, of course, and for some reason I filed that away under “quirky throwbacks that surely have no place in the modern world,” but to my surprise it’s alive and well there, especially among the middle class. There’s even a huge matrimonial website employed primarily by mothers and fathers to get their kids hitched. Millions upon millions of unmarried 20- and 30-something Indians are compelled by their parents — busybodies who’ve harnessed cold, dispassionate technology to shortlist potential mates with appropriate linguistic, religious, and economic backgrounds, not to mention compatible castes, blood types, and astrological signs — to show up for businesslike interviews with these presumably ideal specimens. From the sounds of it, the meetings are excruciating, usually kicking off with the would-be husband asking embarrassingly forthright questions of his would-be wife, things like “Do you cook well?” and “What are your goals in life?” Many Indian men and women privately chafe at the indignity of it all and go along with it just to humour their folks, and they resort to increasingly elaborate and hilarious explanations why their most recent introductions just didn’t cut the mustard. What’s remarkable, though, is how there’s no evidence that newfangled boy-meets-girl marriages, which are on the rise in India, are any more successful than the old-fashioned arranged kind. Jayoti later introduced me to the impressive new Delhi Metro, which, unlike much of the recent Commonwealth Games infrastructure, was completed ahead of schedule and on budget and hasn’t yet killed anybody due to shoddy construction. It’s a marvel of organization in there, when you consider that its 1.5 million daily riders all have to undergo an airport-style security check, and I never waited in line more than a minute or two. The high-security vibe in the metro system, borne of the 2008 terrorist attacks in Bombay, doesn’t stop on the way in. While riders wait on the station platform, a woman’s voice on the PA instructs them, in Hindi and English, to not talk to strangers. I took another autorickshaw out to Vespabretta, on the western edge of town, and did my meagre bit in putting all the parts back together. 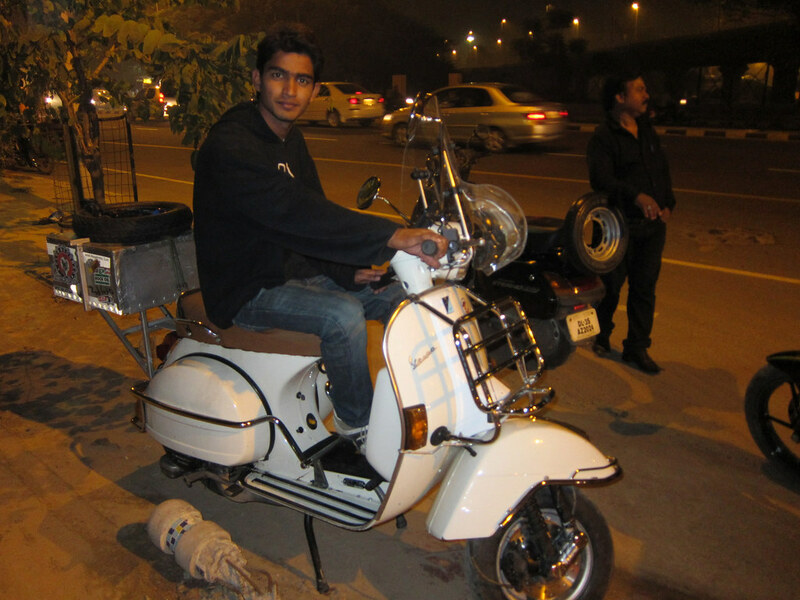 Sunny’s crew adjusted the carburetor, I re-installed my windscreen, and I was soon let loose on the mean streets of Delhi. NEW DELHI — Sunny the Sikh, the affable owner-operator of Vespabretta, met me at his family home before giving the truck driver directions to his garage. The middle-class prosperity of his neighbourhood quickly gave way to the crushing poverty evident the next colony over, and we chugged down rutted macadam roads alongside gag-inducing open sewers lined with shanties and cows and throngs of people. Dust churned up by the traffic hung in the air, stinging the eyes and reducing the winter sun to a wan little white disc. Things brightened a bit by the time we reached his garage, and it was obvious that what was once a desperately poor neighbourhood was quickly gentrifying: between the hovels and garbage-strewn empty lots, new construction projects were in progress, and the main roads were laid with fresh tarmac. Sunny’s crew got the crate off the flatbed, and they tore it all apart as I, standing to the side with a cup of milky tea like some colonial nabob, oversaw operations. 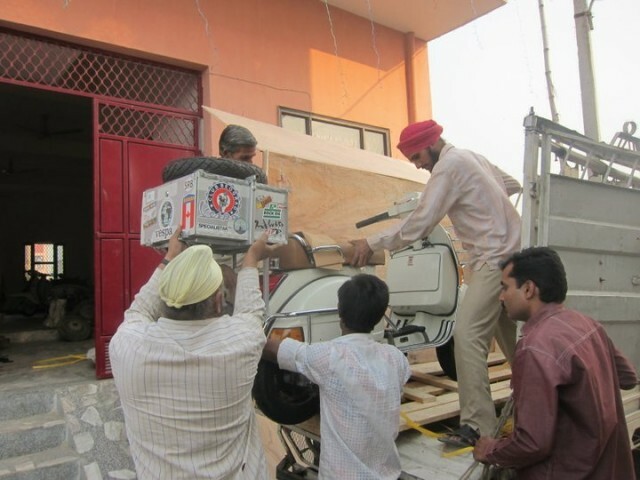 The bike was wheeled inside, I paid the truck driver, and Sunny’s crew went at my Vespa with a vengeance. Next up came some top-down diagnostics. As I explained in a previous post, the clutch was indeed in a bad way, but I’d also managed to strip out the teeth of the brake drum yet again as I approached the airport back in Dubai, which handily explained why the bike wouldn’t, you know, go. For some reason, that big nut holding the damn wheel in place kept coming loose, no matter how much I tightened it, and it only took a few thousand kilometres before the main shaft churned through the weaker steel of the drum. 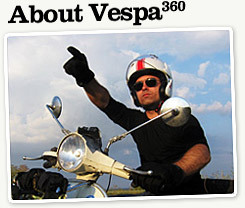 Thankfully, Vespabretta had plenty of spares on hand. Sunny’s boys then listened to the engine, and it was immediately obvious that it had problems. Big problems. I was so exhausted from the day’s exertions back at the cargo airport to stick around for more investigation, though, and I just asked Sunny to do what he had to do and that I’d be back after Diwali. 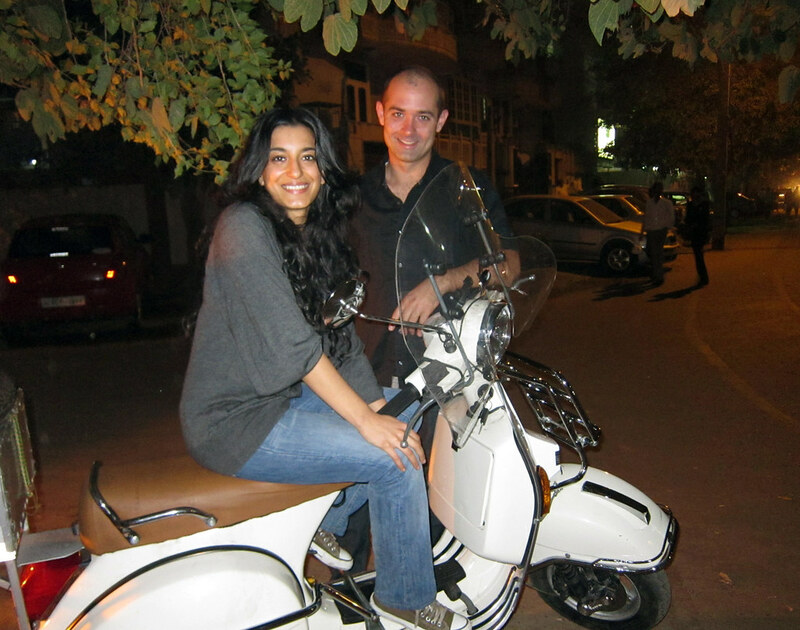 This was fine with them, and I hailed an autorickshaw and enjoyed a bumpy ride back to West Patel Nagar. That night, I decided to get out of my room and go for drinks with a recently transplanted Delhiite I’d found via Couchsurfing. Shivani, currently an interior designer and formerly working for NPR‘s South Asia bureau (yes, American public radio actually maintains a network of international bureaux) suggested we meet at The Living Room in Haus Khas Village. This combination restaurant/bar/art gallery was a revelation: there was a delightful rooftop patio, imported Brooklyn Lager, and a menu of international and Indian food. Four Tet’s hauntingly beautiful track “Angel Echoes” played on the stereo as a funky and cosmopolitan crowd quietly mingled, and I marveled at how it was a world apart from the hellhole I’d been staying in for the past week. Of course, the prices on the menu were chastening. India, land of contrasts. NEW DELHI — Getting myself to to the Indian subcontinent was tricky enough; my main concern after that was the fate of the Hamburglar, which I’d last seen in Dubai as it disappeared within a wooden crate, destined to wing its own way to Delhi via Emirates Air Cargo. In the meantime I holed up in the West Inn, with its bloodstained bedsheets, its many falling fixtures and appurtenances, and its medium-voltage electrocuting shower, which, oddly, wasn’t all that unpleasant to use. (It was actually pretty invigorating.) Outside my little smudged window there was India, with its crowds, honking horns, and, increasingly, explosions from thousands of Diwali firecrackers set off by little boys at all hours, and I’d routinely peer out from behind the curtain and wince at all the confusion. Of all the countries I’d been to since rolling eastwards out of the European Union last July, India was among the most well-known and well-touristed, and yet there I was, huddled in my hotel room and cringing at the prospect of dealing with any of it. I kept myself fed via room service, starting with the tamest Indian standards I recognized (butter chicken and lots of naan, which I was surprised to discover tastes just like the butter chicken and naan back home) before getting a little adventurous and picking dishes from the menu at random, one of which eventually made me sick. A mad dash to the can in the pitch darkness of a power outage — the lights went out three, four, five times a night — isn’t nearly as fun as it sounds. For the first time in this trip, I felt like I was in over my head. I ventured outside, once, to have coffee with Deboshree, the cousin of a friend of mine from Budapest, and the ten-minute walk to the Coffee Day Café to meet her took some real effort. There are no real sidewalks in that part of Patel Nagar, just broken clumps of half-hearted attempts at them, nor is there much light on the street at night, and being a successful pedestrian — in other words, not being sideswiped by a wildly careening autorickshaw, or falling into a very deep hole — required a surefootedness and vigilance I’d never had to summon when going for a stroll. Just being out in public in Delhi brought its own little dramas at every step. I shuffled down the dusty road, stubbing my toes on the rubble while my head, swivelling idiotically, scanned for incoming obstacles, and where my fellow pedestrians somehow managed to gracefully slalom through the chaos, my own route was more Frogger-style, all right angles and jerky movements. The Coffee Day Café, meanwhile, turned out to be nothing at all like what’s out on the street. It’s a haven for India’s rising middle class, and could be a clean, sterile, chain coffee shop just about anywhere. Their coffee is decent, their brownies are delicious, and it was great having a chat with a local resident who had a pretty good handle on how things worked thereabouts. Listening to her, I was reminded of my Indian friends in Canada, all of whom suffered (or thrived, depending on who you ask) under the grim tutelage of parents concerned with education above all else. As I spent more and more time in India, this stereotype — of the Indian mom and dad who will not rest until their son or daughter has become a successful doctor or lawyer or engineer or some other respectable, stolid kind of professional — just got more and more ingrained. They really can be like that.